The Akha originated in Yunnan where the majority of the group still live. They have been migrating over several centuries southward. 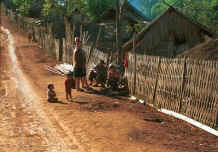 In the middle of the 19th Century considerable numbers moved into Kentung State in Myanmar. Others moved into Laos and Vietnam. It is thought that the Akha in Thailand came from Myanmar. Most of the Akha in Thailand today live in Chiang Rai Province. Almost all of the photos were taken in a village in the hills around Chiang Rai in northern Thailand except for one taken on the banks of the Mae Kok River above Chiang Rai. See Hani (Akha) references.